Products featuring natural and organic ingredients are becoming more popular, reveals Joel Schlessinger MD. Organic foods and household products are now available in many super markets and drug stores across the country. Because these items are made without harsh chemicals, more and more people are switching out their everyday products with natural formulas. The same goes for skin care, according to Joel Schlessinger MD. In this presentation, he explains the difference between natural and organic products and why they are beneficial. Many conventional cleansers, creams and treatments contain chemicals and toxins that irritate sensitive skin and cause damage. Natural and organic items avoid these ingredients and replace them with natural alternatives that do not aggravate the complexion. How are natural and organic products different? Joel Schlessinger MD answers. Not all natural skin care lines are equal. To be considered a natural product, the formula must simply contain ingredients that are derived from sources such as plants and minerals. The use of “natural” on a label is not regulated by any organization so be wary of products that claim to have natural formulas. Organic products have been certified by the USDA or other organization to contain a minimum of 95% organically produced ingredients. The formulas are free of synthetic chemicals, genetically modified substances and harsh additives. These items will often display the USDA or organization seal. Joel Schlessinger MD recommends brands that avoid harmful ingredients. When searching for a safe and healthy skin care brand, it is important to do extensive research and find out which manufacturers meet organic or natural qualifications. One brand that is certified by the USDA and other international organizations is Eminence Organic Skin Care. This brand is free of parabens, mineral oils and other harmful ingredients. You can also try the Dr. Hauschka line which features cosmetics, skin and hair care products made with plant extracts. Discover more brands that feature natural ingredients at LovelySkin.com/NaturalSkincare. Learn about sulfur from Joel Schlessinger MD to see if it’s right for you. When you think of beneficial skin care ingredients, sulfur may not immediately come to mind. Despite negative misconceptions, however, this natural mineral can address common concerns and improve the appearance of the skin. Read facts from Joel Schlessinger MD about this ingredient to learn the benefits and risks of these featured products. Sulfur is an antimicrobial ingredient that eliminates bacteria on the skin’s surface. This substance also helps absorb excess oil to reduce the appearance of shine. Joel Schlessinger MD recommends sulfur products for oily, acne-prone skin. If you suffer from a shiny complexion and breakouts, try adding a product with sulfur to your routine. These cleansers, masks and treatments renew the complexion to remove dirt, oil and impurities from clogged pores. Products with this ingredient will help eliminate blemishes, whiteheads and blackheads, preventing them from returning. Because this mineral has a high pH, it can cause redness, flakiness and irritation for those with sensitive skin. People with a dry or easily irritated complexion should avoid this ingredient. Women who are pregnant or nursing should check with their physician before applying products with sulfur. Products recommended by Joel Schlessinger MD can purify skin and heal blemishes. Treating your acne-prone or oily complexion with sulfur can help clear breakouts and prevent them from returning. Clinicians Complex Acne Drying Lotion is a potent product that eliminates bacteria on the surface to avoid aggravating acne-prone skin. You can also use Murad Acne Clarifying Mask once a week to remove oil and other impurities from deep within pores and promote a healthy complexion. Find more products at LovelySkin.com/Sulfur and check out other presentations by Joel Schlessinger MD on SlideShare. Everyone ages in their own way. 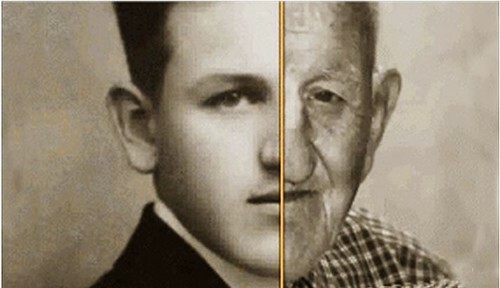 In a recent article on Fstoppers.com titled “10 Incredible GIFs Showing How Aging Changes Our Appearance,” one photographer snapped pictures of men and women to mimic a photo of them 50 to 60 years earlier. Joel Schlessinger MD says the differences between their young and old photos are incredible. “Clearly, these are some of the most impressive before and after pictures we have ever seen,” he says. The signs of aging are unpredictable, Joel Schlessinger MD explains. Fine lines, wrinkles, dark spots and sun damage are just a few things that come with aging. Joel Schlessinger MD says these signs of aging can be delayed by taking care of your skin and seeing a skin care specialist. These treatment options have become popular among patients who want to delay fine lines and deep wrinkles. Joel Schlessinger MD says proper skin care can also keep your complexion looking youthful. The best way to prevent premature aging and sun damage is to apply a broad spectrum sunscreen every day. Along with proper sun protection, Joel Schlessinger MD recommends finding products that cater to your specific concerns. LovelySkin carries a wide variety of anti-wrinkle treatments, skin brighteners and more. Do you have a question for Joel Schlessinger MD? Let us know in the comment section. Poison ivy is a common issue for many adults and children, says Dr. Joel Schlessinger. Each year, dermatologists see many patients who are dealing with plant-based rashes that they were exposed to while hiking, camping, gardening and enjoying the outdoors. This irritating condition is the result of an allergic reaction to certain plants. In this presentation, Dr. Joel Schlessinger explains the best methods for relieving these symptoms and healing your skin. Poison ivy, poison oak and poison sumac produce toxic oil called urushiol that causes an irritating rash. This substance affects people differently so some individuals may be more sensitive than others and develop more severe symptoms. What does a poison ivy rash look like? Dr. Joel Schlessinger explains. Toxic plant oils can be transferred through direct contact or through clothing, shoes and other exposed items. After you have encountered a poisonous plant, it usually takes between 12 and 48 hours for a rash to appear. Outbreaks can happen anywhere on the body and usually develop as a red rash that itches and is slightly painful. Blisters can also appear in severe reactions. Symptoms may last anywhere from a couple of days to a few weeks, depending on your skin’s sensitivity to the plant. Dr. Joel Schlessinger discusses the best way to treat this rash. Immediately after you have been exposed, gently wash the area with soap and water to remove toxic oils. Use a gentle product such as Noble Formula Bar Soap to avoid further irritating the area. You should also visit a dermatologist who can provide prescription steroids to heal the rash. For an at-home treatment, use a product with hydrocortisone such as FixMySkin Healing Body Balm Unscented with 1% Hydrocortisone or Obagi Nu-Derm Tolereen. This ingredient will heal damaged skin and relieve itching, redness and irritation. Discover more ways to deal with common skin issues by viewing Dr. Joel Schlessinger’s SlideShare presentations. Joel Schlessinger MD discusses argyria, a condition that causes skin to turn blue or gray. Precious metals have been used in many cultures to treat health conditions for thousands of years. While certain metals such as iron and calcium are necessary for humans, other metals like silver can have dangerous effects on your health. One result of overexposure to silver is argyria, a condition that turns skin a bluish or gray tint. 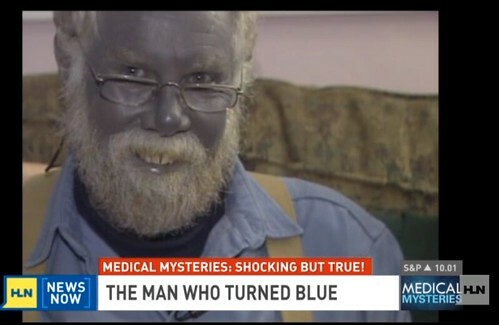 Paul Karason became famous for his blue skin caused by self-prescribing silver for his dermatitis. According to Joel Schlessinger MD, this issue could have been avoided. Self-prescribing topical solutions may have serious side effects, reveals Joel Schlessinger MD. Karason suffered from dermatitis, an itchy and inflamed skin condition, as well as other health issues such as arthritis. To treat these problems, Karason applied colloidal silver, which has been prescribed for skin and health issues in the past. Prolonged exposure to this substance caused his skin tone to permanently turn blue. Unfortunately, says Joel Schlessinger MD, argyria cannot be reversed. Once the skin turns blue, it will permanently remain that shade, which is why you should be extremely cautious before you begin any treatment with silver. Along with changes in skin tone, silver can cause other health issues including difficulties breathing and stomach pain. Always check with a dermatologist before you use any product for your skin condition. You should also read all ingredient labels to avoid applying harmful formulas to your complexion. For more information on rare and unusual skin issues, read Joel Schlessinger MD’s blog. Using a face cream on your neck may not be cutting it, Dr. Joel Schlessinger explains. There are plenty of people who wouldn’t dream of skipping their face cream in the morning. They diligently cleanse, tone and protect the complexion without realizing they are ignoring a highly exposed and often damaged area. In this presentation, Dr. Joel Schlessinger explains why it is important to invest in a neck treatment and which method is best for you. The skin on the neck and chest is very thin and, therefore, more susceptible to damage. This area is also frequently exposed to UV rays and free radicals. Products that target the décolletage repair and rebuild damaged skin. Dr. Joel Schlessinger lists sun damage and loss of firmness as the main concerns that affect the neck area. Many people forget to apply their sun protection product below the chin. This causes signs of damage to appear including dark spots, fine lines and a rough, uneven texture. Skin on the neck and chest also loses collagen and elastin as we age, making the area appear loose and saggy. There are several cosmetic procedures available that can restore a healthy and youthful appearance to the skin. Pellevé is a non-invasive treatment that uses radiofrequency waves to stimulate the production of collagen. This increases the firmness and elasticity of the area while minimizing the appearance of fine lines and unevenness. Try these products recommended by Dr. Joel Schlessinger. Along with a sun protection product, anti-aging creams formulated for the neck can reduce and prevent the appearance of damage. Revision Skincare Nectifirm is a top-selling cream that tightens and firms the décolletage while hydrating the delicate skin. To fade dark spots, try Obagi ELASTIderm Décolletage System, which uses hydroquinone to brighten the complexion. Visit Dr. Joel Schlessinger’s SlideShare page to view more presentations on skin care.